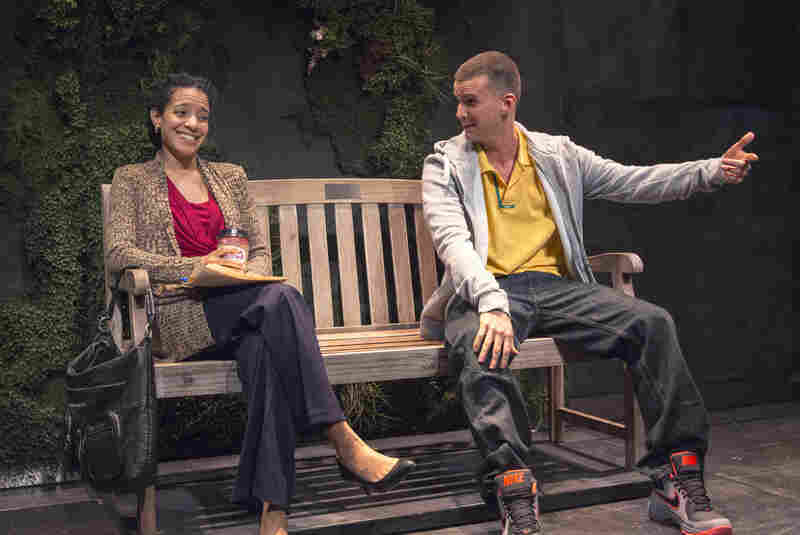 A Vet's Haunted Homecoming In 'Water By The Spoonful' Quiara Alegria Hudes' Pulitzer Prize-winning drama opens off-Broadway on Tuesday. The play is the second in a trilogy focused on an injured Iraq veteran named Elliot — a character based on Hudes' cousin. "I just remember the instant I saw him, there was just something changed in his eye," she says. Water by the Spoonful is the second play in a trilogy featuring a character named Elliot, an injured Iraq war veteran who has returned to his home in North Philadelphia. Elliot is based on Hudes' cousin, also named Elliot. She says she went to visit him on a military base shortly after he returned from Iraq. "I just remember the instant I saw him, there was just something changed in his eye," Hudes says. "You know, he was still absolutely the same young clown of a cousin I had always known and had grown up with, loving, but there was something different. And I felt that I might never understand it. And that's the simple spark that it came from." As Hudes began writing about Elliot's experiences, she says she noticed there were more and more young people in uniform showing up in Elliot's Latino neighborhood in North Philadelphia. She thought to herself: "It's not just Elliot's story. This is going to be the story of a generation." Armando Riesco's character Elliot was inspired by Hudes' cousin, also named Elliot. Riesco has played Elliot throughout the trilogy. 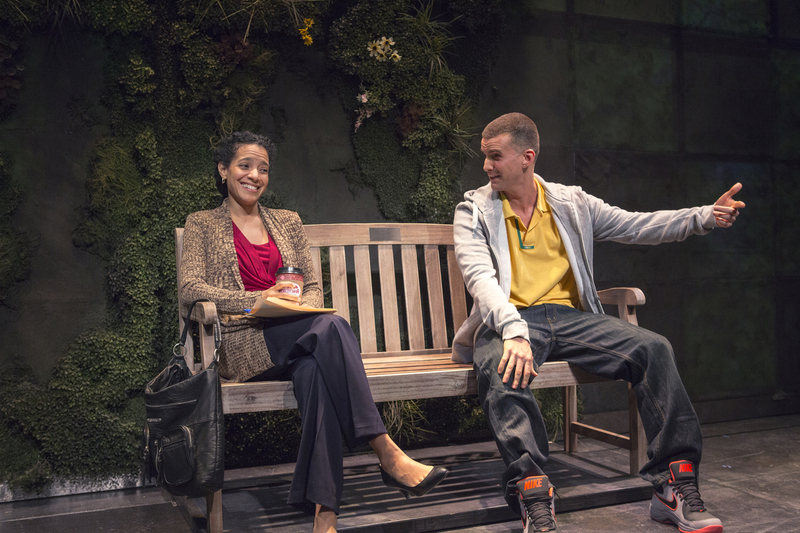 He's pictured above in Water by the Spoonful with Zabryna Guevara, who plays Yazmin Ortiz. Armando Riesco has played Elliot since the first play premiered in 2006 and will be playing him in the final installment of the trilogy, when it opens in Chicago this spring. In Water by the Spoonful, Elliot is haunted by his experiences in Iraq and working in a mind-numbing job at a sandwich shop. Riesco says he went online to veterans' chat rooms, to do some research. "The very first story that I found there was a 24-year-old Marine that came back with a leg injury, that was working a dead-end job and who just did not know what to do with his anger," Riesco says. "And I thought, 'There's a lot of this out there.' "
The online world is a large part of Water by the Spoonful, though it doesn't seem directly related to Elliot's story — at least, for most of the play's first act, says director Davis McCallum. "The play is in part about families," he says, "because there's a blood family in North Philly and then there's a family of choice that kind of congregates in this online chat room." It's an online chat room for recovering crack addicts. These two stories work in parallel for the first act and eventually collide in the second. McCallum says the relationships in the online community are every bit as real as the ones in the flesh-and-blood family — for the most part. Liza Colon-Zayas plays a troubled character named Odessa Ortiz, who finds her better self online. She's pictured above with Bill Heck, as Fountainhead. "They're so close in every way, except for physically," McCallum says. "There's a moment, late in the play, where two characters meet, face to face, for the first time. ... It's really a great piece of writing, because you realize that they know everything about the other person, you know, except for what they look like and what their name is — which we think of as two of the most fundamental ways people define themselves." Where these two worlds meet is in a character named Odessa — or HaikuMom, which is her online alias. In the play's explosive second act, the audience discovers how this calm, placid nurturing figure in the chat room became estranged from her family, which includes Elliot. Liza Colon-Zayas plays the troubled character, who finds her better self online. "You can remake yourself, you can reimagine yourself and start fresh, in a way that she can't do in her own community, with her own family," Colon-Zayas says. Ultimately, all the characters in Water by the Spoonful are dealing with deep reservoirs of pain and guilt and are knocked down by their demons, says McCallum: "One of the central things about the play is, after you get knocked down, by what means and through what set of actions do you go about the process of getting back up?" That, playwright Hudes says, is what leads to a hopeful ending, as these disparate characters, with their disparate stories, come together in sometimes surprising ways. 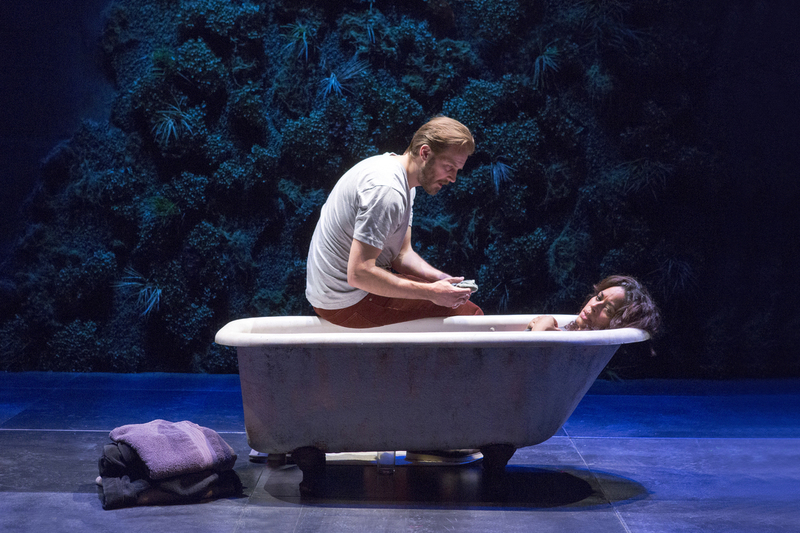 Water by the Spoonful plays at Second Stage, off-Broadway, through Jan. 27. The third play of the Elliot trilogy, The Happiest Song Plays Last, begins performances at the Goodman Theatre in Chicago on April 13. "You know, I think Water by the Spoonful has what I would almost call three love stories, though the love is not necessarily romantic at all," Hudes says. "But I think it is, in some ways, a play about finding love and grace and companionship in unexpected places." As for the real Elliot, Hudes says her 27-year-old cousin has succeeded in rebuilding his life. He's now employed full time, going to college in the evenings, and will be there Tuesday night for the opening. "There's a lot of gratitude in both directions," Hudes says. "I'm excited for him to see this play again and I'm excited for him to walk the red carpet and kind of stand up tall and flash his big cheeseburger smile and, you know, be honored as a young American man."